What’s greater than the combination of chocolate and cheesecake! 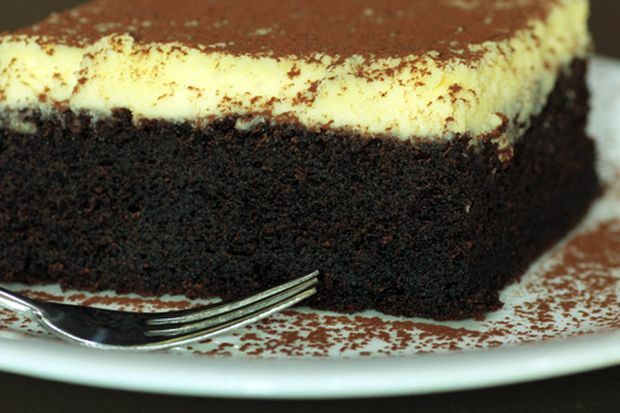 Try this amazing recipe of moist chocolate cheese cake now! This recipe and photo are courtesy of Venisri Senthan who blogs at love2cook-malaysia. In a bowl, sift together all purpose flour, cocoa, baking powder and soda. Using an electric mixer, beat butter and sugar until smooth. Beat in eggs, one at a time. Add vanilla essence. Add evaporated milk and flour mixture gradually, continue beating using low speed until fully incorporated. Scrape the sides with a cake spatula. Pour batter in a 20cm lined cake tin, bake for 15 minutes at 170 degrees Celcius. Beat cream cheese, caster sugar, egg and vanilla essence until smooth. Fold in sour cream. Bake for another 40-45 minutes at 150 degrees Celcius. The cake is done when the top is firm to touch. Cool the cake on a wire rack and refrigerate for at least 3 hours before slicing. Can I know when pouring the cheese mixture to the half bake choc cake, is the choc cake still hot or hv to cool down first? Thanks for writing in. Pour the cheese mixture while the chocolate cake is still hot. I use the 20″ round cake pan. All the cheese mixture mix into the cake batter when i pour onto the top of the cake after half bake 15 min. Pls help. Thanks for your feedback. Oven temperature may vary from oven to oven. Since this is the case, 170 degrees Celcius in your oven could take 5-10 minutes longer to reach the half baked state than the time required in the recipe. This is probably why the cheese mixture got mixed with the cake batter.When the cake is half baked, you need to slowly pour in the cheese mix.